Add the refreshing taste of real fruit to your popular smoothies and blended drinks with this Torani peach puree blend! It adds fresh-picked peach flavor and vibrant orange color to peach daiquiris, sodas, milkshakes, and fruit juices that will keep your customers coming back for more. 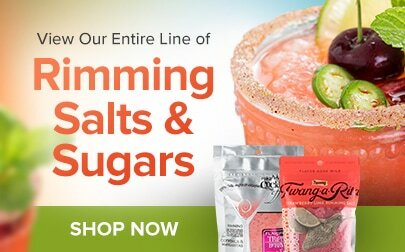 The sweet, summery taste of peach is perfect for enhancing a variety of creamy, blended drinks and other recipes, including desserts! 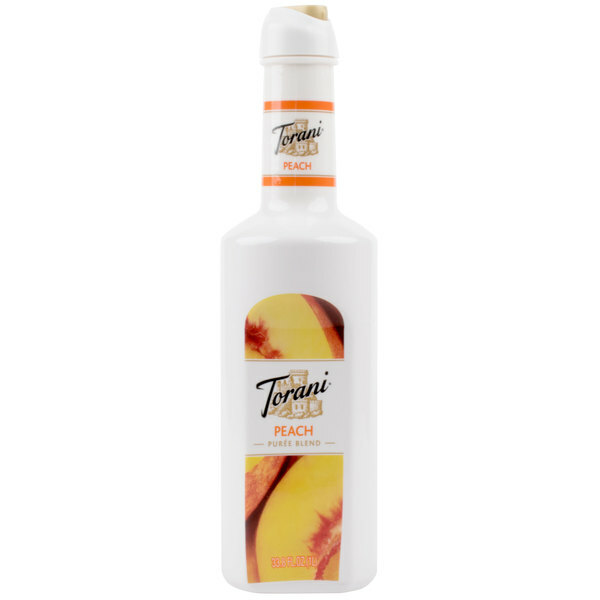 Compared to other puree mixes, this Torani peach puree blend has a thick, syrupy texture and may contain some fruit pulp. This thicker texture ensures that you won't need to add as much to each drink so you can get more servings out of one bottle to save costs! Torani puree mix also contains a percentage of real fruit juice, giving it a naturally sweet and fruity taste for your top-selling fruit smoothies. This 1 liter bottle of puree blend is shelf stable and features a user-friendly design with a resealable cap, making it easy to store and keep the product fresh. 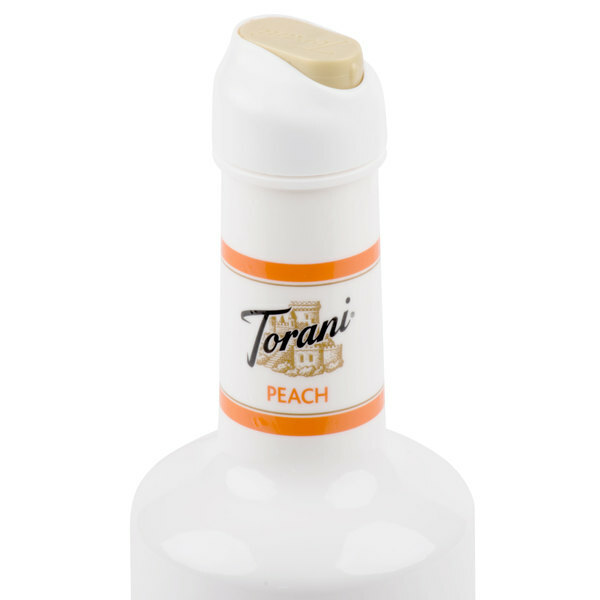 With its many great features and uses, this Torani peach puree blend is a must-have for any bar, coffee shop, or cafe! 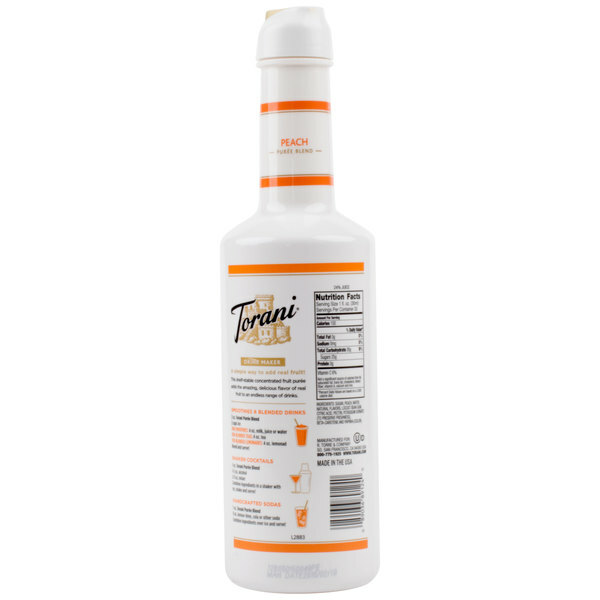 Founded in 1925, Torani started as a family company in southern San Francisco and has since grown to an international brand of quality mixes exporting to 40 countries around the world. Their sense of tradition and experimental ambition have expanded their product line to dozens of varied flavors, including the Classic Caramel and the unique Chicken 'N Waffles, yielding a flavor for almost every palate and recipe. 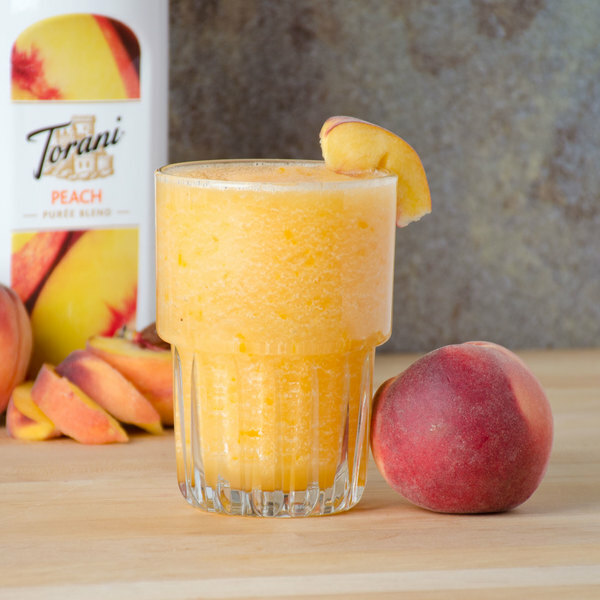 The Torani peach puree blend is perfect and taste fabulous. The peach flavor is so strong and luscious making for excellent cocktails and milk shakes. The flavor is on point with this one! It tasted like peaches pureed! This is great for smoothies or as an additive to lemonade as well! 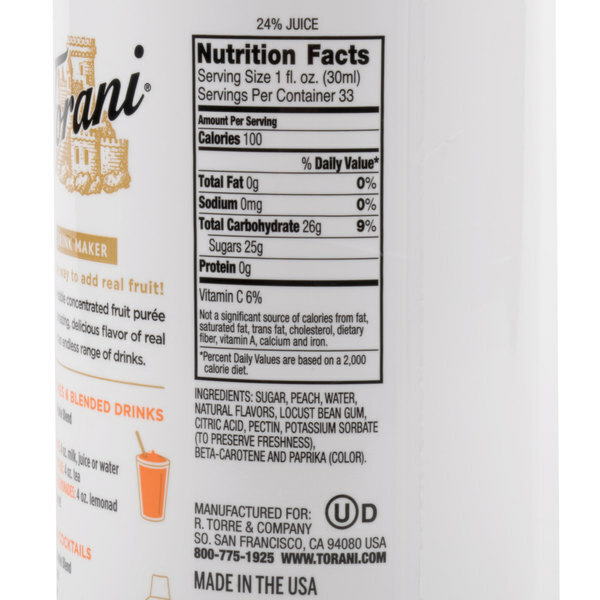 We use these Torani fruit purees for our blended smoothies, the taste is amazing, shelf stable is a plus and the bottle design is perfect for maximizing storage. i use this peach puree blend a lot in the summer at my bar. peach is a very popular flavor and this is what i use to make those drinks. We use this to add flavor to milk kefir. It goes well with the kefir flavor and consistency. We just add about 1 tablespoon to 6-8 oz of kefir and mix it up. Delicious! I use this to make homemade peach ice cream and oh boy does it taste good. I was tired of peeling and pitting fresh peaches and finally just said no more. I bought this puree and it was awesome. If you want a smoothie that tastes like peaches, this will accomplish that for you. Recipe on the side of the bottle makes getting it perfect every time. My grandkids love the smoothies! Strawberry and peach are their favorites! 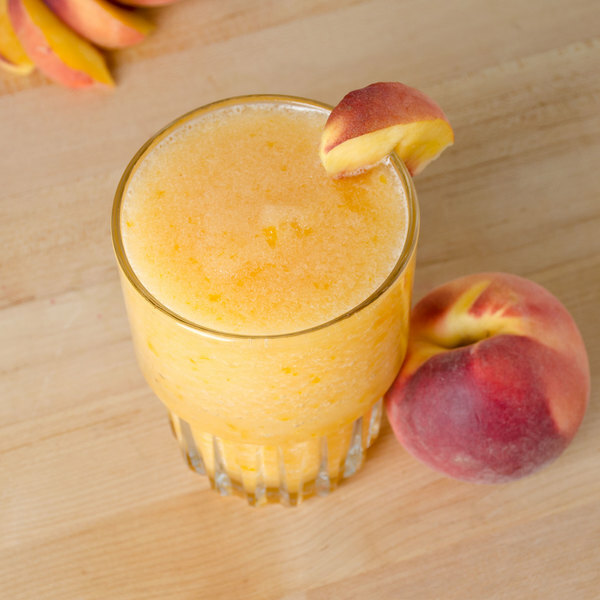 Peach puree is so good blended into your favorite beverage for a sweet and refreshing twist. It is also great to add to pancake batter for so delicious peach pancakes.